Sandamadala is a mountain situated at the northern border of knuckles massiff. We planned this hike during a dry day. We travelled to Naula via Kandy and Matale and then we turned to Elahera road and again turned to Opalgala road at Ambana junction. Hinguruwatta Kanda is a beautiful peak with nice view points situated at upper border of Knuckles massif. This is our one day journey to this peak. Sandamadala is a peak with 800m height situated at the edge of Knuckles massif. 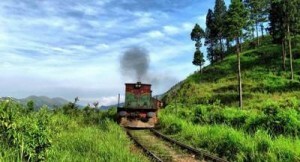 It can be easily climbed through a mana patch from remote village Kotagala at Matale district. The smartly dressed engine driver reminded me of a senior air force officer. Their uniforms were that good. Climbing up the steps into the engine at Nanu Oya was like a dream. Thinking back, I was as if sleep walking into it. Inside, the space was fully occupied by the two comfortable seats for the engine driver and his assistant, pilot and copilot in aviation terms. Behind them in the middle were two fire extinguishers. They could move about along the narrow path behind the seating. The engine compartment was the bulk of the sky blue enclosed wagon with no access whatsoever for others including them. If there was, I wasn’t gonna push my luck that far. The full length dashboard has various control panels including the touch LCD screen of the computer making it easy for the operators. The German and Canadian engines are more towards manual operations whereas this Chinese is largely computer-controlled. Soon we entered a tunnel and it seemed to take forever to get to the other side. 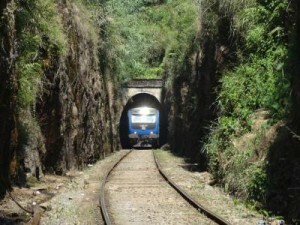 It was the world famous Singhamale Tunnel. 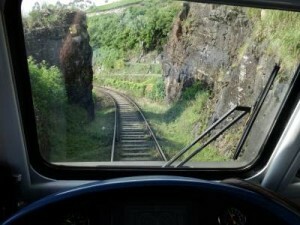 There were a plenty of workers who got off at a tiny station called Galkanda Watta between Hatton and Kotagala just passing the Singhamale Tunnel, the longest in SL. The view afterwards was simply amazing and it made Ana and me get out of our seats and come to the door pointing our cameras at the surrounding. The early morning rays of the sun kept peering through trees and mountains making patters on the dewy leaves. The mist hung in midair as if hung with an invisible thread. We felt like going through heaven.